This situation that you are looking at right now isn’t exactly a grilled cheese nor is it a panini. This Tomato Brie Sandwich is much more than just a sandwich though so I just decided to call it a situation. It’s a situation that you should try to get involved in because it’s not terribly hard to make and will knock your tasting socks off. 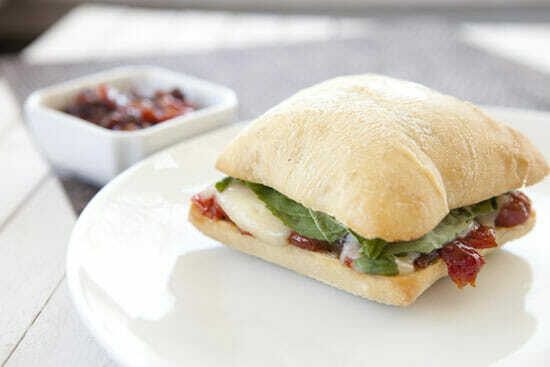 Homemade tomato chutney and rich brie topped with a heap of fresh basil makes for a perfect spring time sandwich. 1) Wash tomatoes well and spread out on a baking sheet. Roast at 450 degrees Fahrenheit for 30 minutes until the tomatoes are blistered. 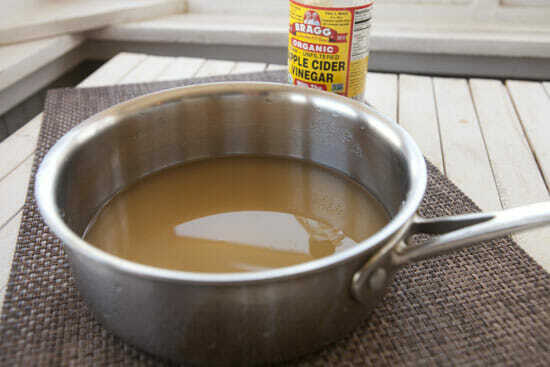 2) Meanwhile, in a medium pot, combine vinegar, water, sugar, ginger, salt, and coriander and bring to a simmer. Add a pinch of cayenne optionally and stir until sugar is dissolved. Continue to simmer so the mixture begins to reduce. 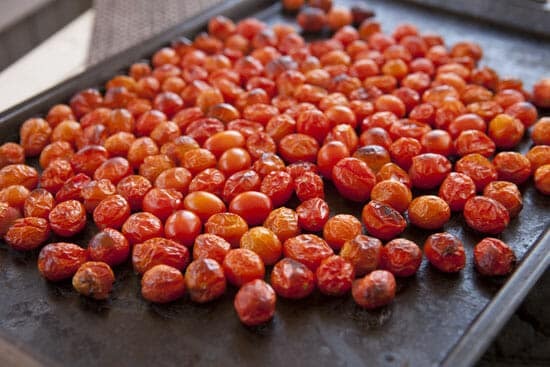 3) When tomatoes are done roasting add them to the simmering pot and continue to cook over medium heat. Use a spoon or sturdy spatula to press on the tomatoes gently so they mash up. 4) After 5 minutes of simmering add raisins and continue to cook until mixture is very thick. Remove from heat and let cool slightly. 5) Cut rind off of brie wheel and cut into strips. Half bread rolls and slather the bottom half of rolls with tomato chutney. Top with brie. 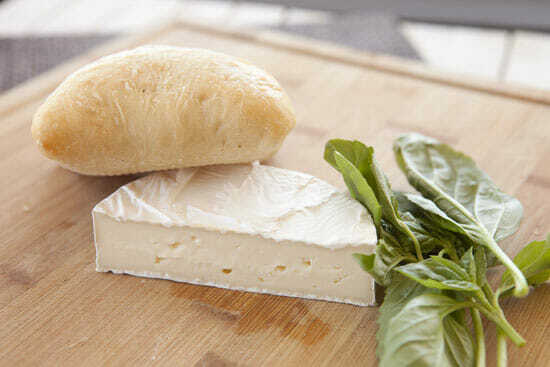 6) Bake the rolls at 450 degrees for 2-3 minutes until brie is just starting to melt. Be careful not to overmelt the cheese or it will break down. 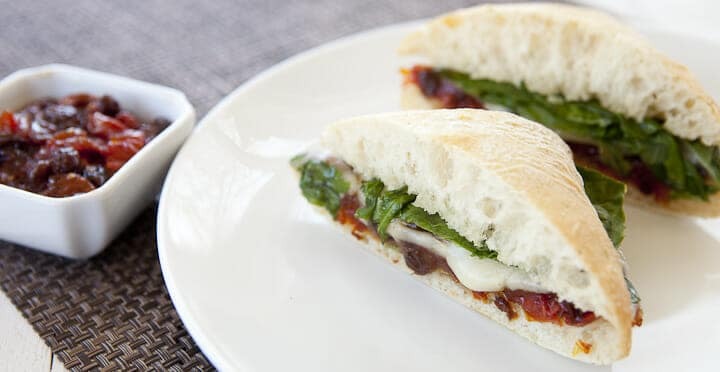 7) Top each sandwich with a handful of fresh basil and the top of the roll and serve immediately! I would say 70% of the flavor in this Tomato Brie Sandwich comes from a wonderful homemade tomato chutney. I kind of winged this recipe and so you should feel free to alter/change it as well. 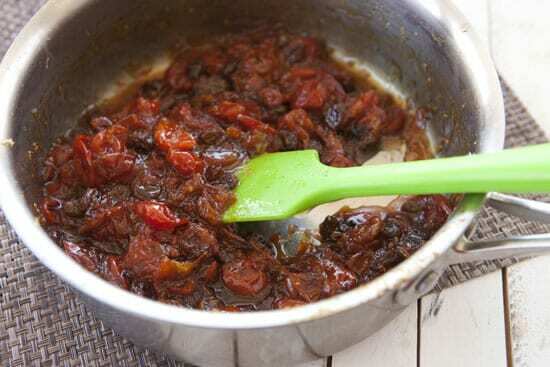 Some chutney’s take hours to make, but this one isn’t so bad because I roasted all the tomatoes in a blazing hot oven before simmering them which cuts down on the cooking time pretty significantly and also intensifies their flavor. 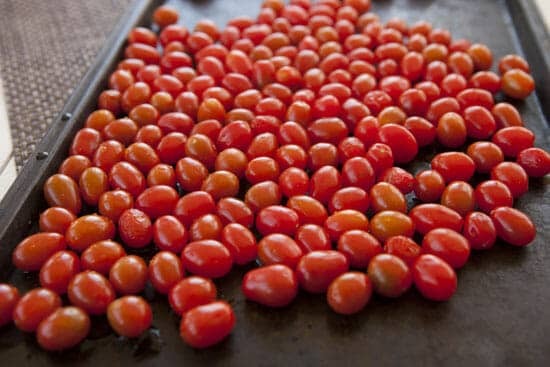 Just spread your tomatoes out on a baking sheet and roast them in a 450 degree F oven for about 30 minutes. Maybe give them a stir halfway through just to make sure they are cooking evenly. After thirty minutes they should be shriveled and blistered and black in spots which is just perfect. While the tomatoes are roasting you can get the rest of the chutney ingredients simmering in a medium pot. You can change up the add-ins but I wouldn’t recommend messing with the apple cider vinegar part. It’s perfect for this chutney. Bring everything to simmer except the raisins and lemon juice and let it simmer over medium heat. Stir occasionally and let it reduce and then when your tomatoes are done roasting, add them in and continue to simmer. Finish the chutney with a squirt of lemon juice and raisins. It should be a really thick mixture and pack a lot of flavor. This recipe is about the right amount of chutney for four good sized sandwiches, but if you are only making one or two, don’t toss the chutney! It’s great on crackers as a snack or I personally like it in salad dressing also. If you pulse it in a food processor a few times with a drizzle of oil, it will go great on a side salad. The chutney is really the hardest part of this recipe and it isn’t that hard. These are the only other things you need to make this guy. Cut the rind off the brie! As far as bread goes, you have a lot of options, but I recommend something sturdy and in roll form. I found these little ciabatta rolls that are perfect. For the brie, there are only two things to remember. First, cut the rind off of the brie before adding it to the sandwich. Second, be very careful not to over-melt the brie. That might sound silly, but trust me. If you melt the brie too much it will break down and you’ll have a big oily mess on your hands. When you are ready to make the sandwich though, just cut your rolls in half and slather the bottom half with the chutney. 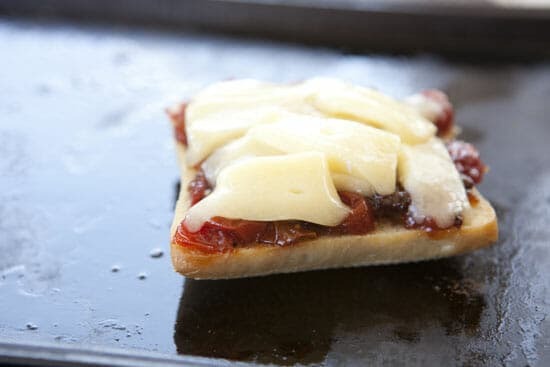 Then add your brie slices and put it back in the oven for just a few minutes. 2-3 minutes is probably about right. The brie should start to melt around the edges and become really soft. This is pretty perfect and try not to melt too far past this point. Then top the thing with a good handful of fresh basil and the top part of the roll and dig in! The brie goes perfectly with the sweet and sour components of the chutney. This Tomato Brie Sandwich is just plain one of the best sandwiches I’ve made in a while. Ha! I usually like it also, but it really doesn’t work great in the sandwich. This is a seriously delicious situation and I want to be a part of it. YUM. Wow! I can have a situation like this anytime!! Good job I have extra pairs of tasting socks!! Great sandwich.. This was a delicious lunch. Instead of making the chutney, I used some tomato jam that I made in the fall canning season. It needs a little bit of balsamic vinegar to round out the flavors though. Do you mean 2 US dry pints raw tomatoes or 2 pints roasted tomatoes? Yea I mean 2 dry pints that are then roasted. :) Hope that helps!